Restaurants and other companies in the service industry face unique challenges when it comes to their point of sale and inventory management needs. This is where POS Lavu comes in. Lavu is a business management software system that delivers simplified workflow and a wealth of customer service tools, all with the convenience of a mobile interface. 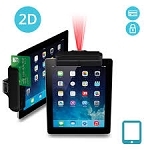 Choose from Infinea tabs for your iPad, secure tablet stands for countertop applications and sturdy POS Lavu card readers, all at the everyday low prices you expect from JR's POS Depot. Simply click on any of the POS Lavu products below to use our easy ordering system, or shop by phone by calling us, toll-free, at 877-999-7374.